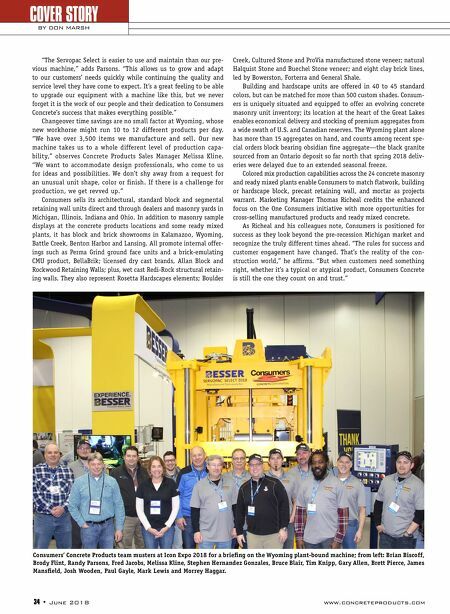 www.concreteproducts.com June 2018 • 35 COVER STORY CONSUMERS CONCRETE Grinding (below) and adjacent dimensioning equipment at the Wyoming plant support Consumers Concrete's Perma Grind and other val- ue-added unit masonry offerings, shipped to dealers and sites throughout the central Great Lakes region. 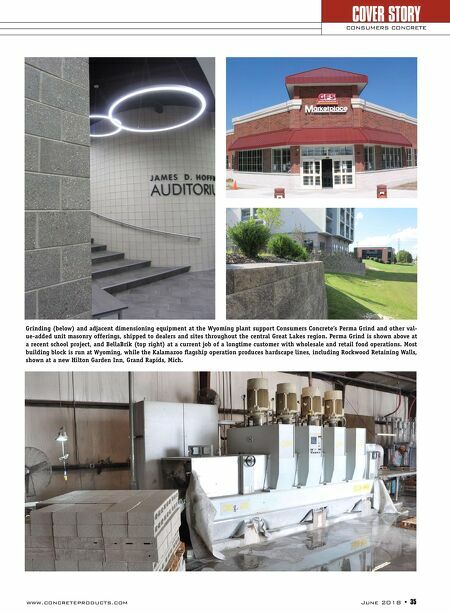 Perma Grind is shown above at a recent school project, and BellaBrik (top right) at a current job of a longtime customer with wholesale and retail food operations. Most building block is run at Wyoming, while the Kalamazoo flagship operation produces hardscape lines, including Rockwood Retaining Walls, shown at a new Hilton Garden Inn, Grand Rapids, Mich.